As i always mention on each and every brownie recipe post, i am huge brownie addict. This post is a quick post, as many of my friends wanted to try this brownie and asked me for the recipe. I am posting the recipe here in midst of preparing for my son's exam:) Yesterday i made oreo brownie for my friends daughter birthday and i shared it on my instagram. Loving all the comments and likes i get there. Between If you are interested in knowing my food trails and my day to day lunch box, please follow my instagram account. Pre-heat the oven to 180C for about 10 minutes. Line the baking tray with aluminium foil sheet or baking paper. grease the baking paper with butter and set aside. Using Double Boiler Method, Melt the dark chocolate and butter. Once its melted, remove the pan to the kitchen counter, Add 1/2 a cup of brown sugar and mix well with a spatula. 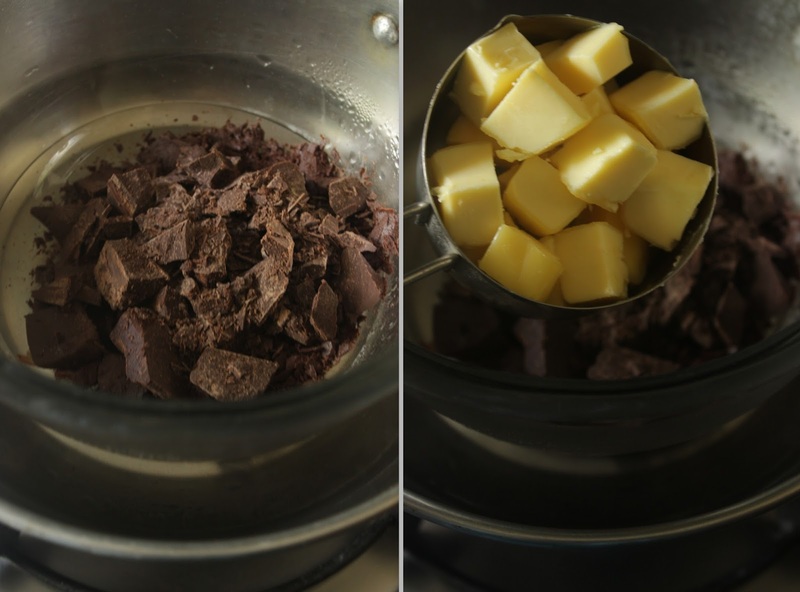 Break in 2 eggs into the melted chocolate + butter mix. with a help of a spatula gently fold the eggs. Then add maida flour to the chocolate mix. slowly fold the flour with the chocolate mix. Add in the chopped walnuts and dark chocolate chips. mix the batter well. Transfer the mixture to the greased baking tray. Bake the brownies at 180C for about 30 minutes. Toothpick inserted at the centre of the brownie should come out clean. Bake the brownies at 180C for about 30 minutes. sometimes it may take 5 minutes to 10 minutes extra. Bake till the toothpick inserted to the centre of the brownie comes out clean. If the Brownie batter is too thick add 2 tsp of milk to the batter. You can increase the sugar by 1/4 cup if you prefer the brownie little bit sweet.